The all in one package for a solid fuel fire solid fuel kits are a simple option for burning solid fuels. 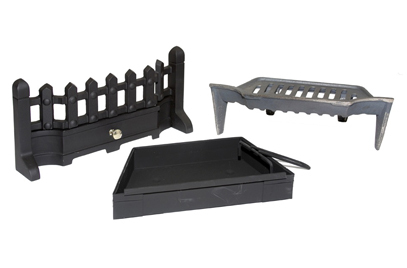 Our solid fuel sets include a set of front bars, grate, ashpan and operating tool. The grate simply slots into you current firebrick, fire clay or cast iron back and you're ready to burn coals or logs. Before purchasing the kit make sure that the fire grate fits your particular fireback. You may also be interested in our range of all night burners which are also an 'all in one' option for burning solid fuel.